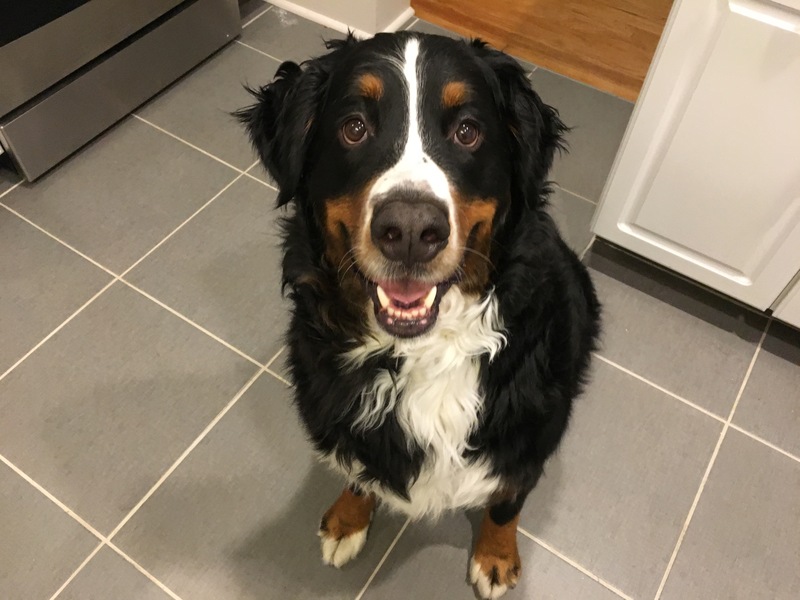 Cooper is a four-year-old Bernese Mountain dog living in midtown Omaha. His guardian asked me for some dog obedience training to stop him from always being underfoot and not respecting personal space, refusing to come inside when called, getting over excited, running out the door, jumping up, not respecting his guardians and some separation anxiety. Kuper showed good confidence and curiosity when I arrive for the session. He came up to investigate me but did not do much jumping and showed a little bit of respect for personal space which caught me by surprise as I know that was something the guardian wanted to work on. I sat down with his guardian to discuss the situation and observe how he interacted with her. Throughout the conversation, Cooper was very nudgy and repetitively invaded her personal space. I knew I needed to show the humans how to disagree to stop dog nudging. I learned that Cooper did not have many rules or boundaries that he was expected to respect. When a dog does not have a lot of rules and structure, it’s easy for them to get the impression that they have the same authority as their humans. When this is the case, then listening to the humans become is optional and you can easily end up with a dog in the way, underfoot or pushy when it comes for asking for attention. I recommended some easy rules to incorporate that will help the dog start to identify as being in a follower position. Each time that his guardian disagrees or corrects him from breaking any of these new rules (within three seconds), she will be helping him see her as more of an authority figure. This is an important factor when modifying behavior or the leader follower dynamic. Because he pawed and nudged her for attention, I recommended that she start using my petting with a purpose method. By asking the dog to perform a small task such as sitting, coming to her or laying down on command before the human pets Cooper, his family members can help him further transition into a follower his mindset. This will also help make petting more of a valuable reward than it currently is. Next I went over a set of escalating consequences that the guardian can use anytime that Cooper violates any of the new rules or boundaries or does something the guardians disapprove of. I had the guardian get up and move across the room then return to her seat so that she could put these new escalating consequences in place while claiming personal space. Although we often don’t even notice when a dog invades our personal space seeking attention or affection, over time this can contribute to the dog feeling that it has a position of authority over the humans. Simply training a dog to respect personal space can have a profound impact on that perception of authority. Next I turned my attention to another problem Cooper had, getting over excited at the prospect of anything that he was interested or enjoyed doing. A perfect example of this was getting over excited with his guardian tried to get him ready to take him for a walk. I had the guardian go through the normal getting ready for a walk ritual so that I could get a good feeling for the dog’s behavior and how to best help. As you can see, Cooper got pretty excited once he realized a walk was in store. Anytime that we have a dog that is in an over excited state of mind, and we continue to move forward, we are rewarding and nurturing that unbalanced energy. By not stopping, we are saying that the over excited state is ok. The energy that a dog has inside the house when it is being leashed up is usually the same energy that they will carry with them throughout the walk itself. If your dog is over excited when you attach the leash, you are almost guaranteed a walk in which the dog will be pulling you all over the place unless you’ve taught it how to properly walk at heal. We reset the exercise and practiced multiple times; stopping or pausing the instant that Cooper started to show that he was in an excited state of mind. It took a couple of minutes and about 10 practice repetitions, but eventually Cooper was able to stay completely calm throughout the entire process. I recommended that the guardian practice this leashing exercise a few times a day. By practicing this exercise without the intention of going for a walk, the humans are able to set aside the frustration and other emotional baggage that builds up when working with a dog who is not cooperating. Because the dog’s excitement makes leashing them more difficult, its natural for humans to get frustrated or rush which can impact the situation. This measured approach will also desensitize the dog to the process of being leased up which should help him learn to stay calm in the future. For many clients, I suggest they practice leashing the dog up a few times a day, at times they have no intention of going on a walk. This was the activity does not always result in a walk which helps a dog start behaving calmly rather than ramping itself all up. I recommended that the guardian apply the same pause or stopping technique for any activity that she engages in with Cooper where he gets over excited and has difficulty controlling himself. Delaying gratification and asking a dog to wait for progressively longer and longer periods of time is a great way to help the dog develop more self-control. By the end of the session, Cooper was showing respect for his guardian’s personal space, was already starting to follow some of the rules that we had introduced and was listening to her better. Practice training the dog to come by petting him and saying “come” every time he approaches a human in the house. Practice calling Cooper to come while he is outside in the backyard, but then letting him remain in the yard after he comes to his human and gets a treat or pet. Consistently enforce the new rules and boundaries within three seconds to help Cooper understand what the human is communicating. Use nonverbal forms of communication to disagree with the dog.